Cresset’s unique solutions are available through easy to use graphical user interfaces, command lines and through workflow solutions such as KNIME™ and Pipeline Pilot™. Using the KNIME interface enables integration of our approach into standard workflows and with other applications. We provide access to all our applications through KNIME™ nodes that call the corresponding command line application behind the scenes. Forge is a powerful ligand-focused workbench for understanding SAR and design. 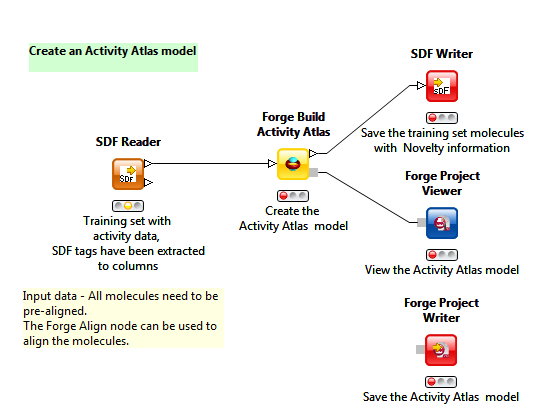 In KNIME the Forge nodes enable ligand comparisons and investigation, scoring of new molecule designs and creation of molecular similarity and disparity matrices. Forge Align – Align and score molecules to a 3D reference molecule using electrostatics and shape or common substructure. Molecules are conformationally hunted if necessary. FieldTemplater – a tool for comparing molecules using their electrostatics and shape and hydrophobic fields in order to find common pharmacophores. Activity Miner – generate similarity, distance or disparity matrix from a set of aligned molecules using 2D and 3D measures of similarity. Forge Build – generate 3D-QSAR models for activity from a set of aligned molecules. Forge Score – predicted activities for molecules against a 3D-QSAR model generated with Forge Build. Forge Model Info – extract information on the primary 3D-QSAR model from a Forge Project. Forge Project Reader/Writer – read or write information and molecules from or to Forge project files. Spark enables you to move to new series and non-obvious IP by swapping scaffolds and exploring accessible R-groups. Given a ‘starter molecule’, you can select a section to replace and Spark will suggest a list of new molecules containing replacement moieties with similar electrostatic and steric properties. Spark comes with several databases of moieties generated from fragmentation of commercially-available compounds, active molecules reported in the literature and available reagents. In addition you are able to generate your own databases of replacement moieties using the database generator functionality. In KNIME the Spark nodes provide access to the scaffold hopping and R-group exploring capabilities with a specialized node to enable graphical specification of the portion of the starter molecule to be replaced. Lastly a database creation node is included. Spark Database Search – search databases for novel scaffolds or R-groups for a specified molecule. Spark Fragment Selector – enables the graphical selection of the region to be replaced by Spark in a database search experiment. Generate Spark Database – generate or updating spark databases of fragments or reagents. XedMin – a ligand minimizer (using Cresset’s proprietary XED force field) to optimize ligands in isolation or in a specified context such as the protein active site. XedeX – create low energy, diverse conformation populations for a ligand. Cresset supplies a generic viewer node that calls the main Forge or Torch graphical user interfaces on the client machine. This node is useful for visualizing the electrostatic fields around molecule or for viewing the results of other Cresset nodes. See KNIME node installation instructions or refer to the latest release notes. The KNIME nodes require you to accept the terms of our license agreement when they are installed but do not require further license files. However, the software used by the KNIME nodes does require a valid license file. Contact us for more information. Cresset provides example workflows that encompass each of the Cresset KNIME nodes. The examples for the Cresset developed nodes are available as a zip file here. Examples that use community nodes to interact with a Blaze server are available as a separate zip file here.